Onomea Bay Cliffside Cottage has all the modern conveniences you'd expect in a high-end vacation rental. With sweeping ocean views from every room in the house, you'll spot whales passing by in winter and the distant lights of Hilo Bayfront. 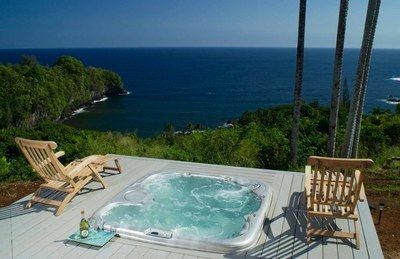 Even the private hot tub overlooks the cliffs and ocean! The kitchen is fully equipped and features silestone countertops, a gas range and that fantastic view. Inside there is a dining bar to enjoy snacks, but the real treat is to dine out on the lanai! The master bedroom has a king size Serta Perfect Sleeper Pillow Top bed and a flat screen TV. The bathroom features a beautiful tub for a relaxing soak as you stare at the unending ocean. There is an outside shower with bamboo privacy screens located on the bedroom lanai. The living room boasts a giant, wall-mounted flat screen TV with DVD player for your entertainment (when you aren't enjoying the ocean view). PLUS a fabulous baby grand piano is tucked in the corner if you feel so inclined! The owners have also thoughtfully provided an iPod dock and high-speed Internet access. PLEASE NOTE: We love kids and we want them to have a great time vacationing with you, but this may not be the best place for little ones to have a great, fun and safe stay. There is an honest-to-goodness cliff about 30 feet from the house, a built-in hot tub on the deck, and fragile decor items inside that could be hazardous to little hands and feet. Of course we defer to a parent's judgment but we need to be up-front the potential hazards. There is so much to do in the surrounding areas if you can tear yourself away from the mesmerizing ocean view! Historic downtown Hilo, Rainbow Falls, Onomea Botanical Gardens, Umauma Botanical Gardens and Ziplines are all within a 10-minute drive, while Volcanoes National Park is less than an hour! Conveniently located, wonderfully private, beautiful grounds, and incredible views! The cottage is clean, well equipped, and very comfortable. This was our second stay and we hope to return again. This was our second stay. When we stayed here last time, we swore this time we'd stay for two weeks, and we did. This will evermore be my idea of a perfect vacation spot. Well-equipped, incredible peace and privacy, a beautiful house, and every comfort. My only quibble would be that it needs more comfortable seating, but everything else is perfection. This is our second stay. It was so impressive the first time we came back four years later. Just a few recommendations. The hot tub was out of balance and we called to have that fixed. It should have been drained and redone but was not. Skin irritations occurred. The batteries in the tv remote were dead; the night light needed a new bulb; there was a light out on the lanai; the flashlight on the front porch needed new batteries and made it difficult for us to gain access the first night to get the key. Little things sometimes add up. We stayed here at the Onomea Bay Cliffside Cottage from December 2-9, 2018 for our honeymoon ... and it was absolutely incredible! The house was beautiful, clean, and well kept. The outdoor shower, which is outside the bedroom, was really cool. The hot tub was a hit for my wife and I as we looked up into the night sky seeing all the stars and hearing the waves hit the cliff below us. The sunrise comes up, quite literally, in your backyard here. It is one of the coolest things we've ever seen and is beyond beautiful to watch! Everything we needed to cook and eat with, except the food, was already furnished in the kitchen. The price really isn't that bad and is well worth it compared to staying in a tight, cluttered resort full of other tourists. We didn't want to leave at all, but sadly had to. We will be staying here again someday when we return to the Big Island of Hawaii. Mahalo for staying with us. We'd love to host you anytime! We had a great time at this rental. Wonderful house with great views. Would rent again. There is a cleaning fee of $120. Extended stays require a monthly cleaning fee. All reservations require a non-refundable $35 damage protection plan and Hawaii taxes of 14.416% We accept major credit cards for payment. We require a 25% deposit to confirm, with the balance due 90 days before arrival. Reservations arriving within 90 days are due in full at the time of booking.